2017 Summer Program – apply now! Bringing together leading authorities in the fields of Chinese and Tibetan Studies alike, Chinese and Tibetan Esoteric Buddhism engages cutting-edge research on the fertile tradition of Esoteric Buddhism (also known as Tantric Buddhism). This state of the art volume unfolds the sweeping impact of esoteric Buddhism on Tibetan and Chinese cultures, and the movement’s role in forging distinct political, ethical, and religious identities across Asia at large. Deciphering the oftentimes bewildering richness of esoteric Buddhism, this broadly conceived work exposes the common ground it shares with other Buddhist schools, as well as its intersection with non-Buddhist faiths. 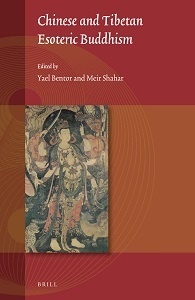 As such, the book is a major contribution to the study of Asian religions and cultures. Contributors are: Yael Bentor, Ester Bianchi, Megan Bryson, Jacob P. Dalton, Hou Chong, Hou Haoran, Eran Laish, Li Ling, Lin Pei-ying, Lü Jianfu, Ma De, Dan Martin, Charles D. Orzech, Meir Shahar, Robert H. Sharf, Shen Weirong, Henrik H. Sørensen, and Yang Fuxue and Zhang Haijuan.